Monitoring your server's network latency can give you a useful image of the overall health and availability of your server. For instance, it let you determine if your network is overloaded or alert you incase of packet loss, which may imply an incorrect router configuration or downed tool. SpokePing's developer, Tobias Oetiker, also developed a data logging and time series graphing utility called RDDtool. 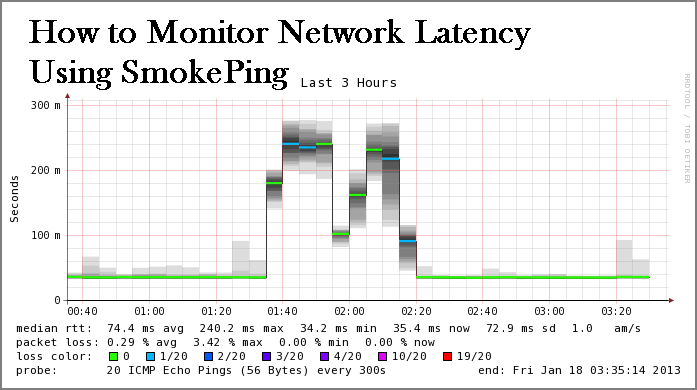 SmokePing uses RDDtool, so you have access to its advanced graphing capabilities too. In this article, we'll walk you through the steps to install and configure SmokePing with Apache on FreeBSD. FreeBSD 11 (Physical or Virtual) machine with a root user. First, we'll install the Apache web server and its FastCGI module, which SmokePing uses to power its web interface. First, update your server's repository information. To install Apache with FastCGI support, you can just tell pkg to install the FastCGI module. pkg will handle all dependencies needed by the module itself, so it will automatically install the main Apache package as well. Confirm the installation by pressing Y. Once Apache is installed, we'll need to customize it to get it working. There are two small changes we'll need to make to Apache: updating some server information in httpd.conf and enabling the FastCGI module. First, open /usr/local/etc/apache24/httpd.conf for editing. Edit the two directives below. Set ServerAdmin to your email address, and uncomment (by deleting the preceeding #) and edit ServerName to your server's IP address. FastCGI is not a default module, so we have to add it to Apache's configuration to load it. To load the module, we'll need to create a new configuration file in /usr/local/etc/apache24/modules.d/ and add the module information. The module README, found in /usr/local/etc/apache24/modules.d/README_modules.d, says "files are automatically included if the name begins with a three digit number followed by _ and ending in .conf". To comply with this, we'll create a file called 001_fcgid.conf. Paste the following into the file, which tells Apache to load the module and where to find it. Now that Apache with FastCGI is set up, we can install SmokePing itself. Installing SmokePing is straightforward because it's in the package repository. SmokePing's configuration is in /usr/local/etc/smokeping/config by default. You'll need to edit this file to customize a few fields. SmokePing has support for a master/slave architecture, to use their terminology. In this article, we're only setting up SmokePing on one machine. Consequently, comment out the *** Slaves *** section of the configuration by prefacing each line with a #. Keep this file open, as we'll continue editing it in the next step to set up SmokePing's targets. The last thing we'll add to SmokePing's configuration file are targets. To paraphrase SmokePing's explanation, targets are a hierarchical list of hosts which mark the endpoints of the network connections the system should monitor. Every target will specify what kind of probe to use, which integrate an external ping command into SmokePing (like fping). In this article, we'll set up a configuration that monitors the latency between your server and two FreeBSD pkg mirrors. We'll create three graphs: two that shows the latency for each of the two mirror servers independently, and one that shows the latency of both mirror servers at once. probe: The ping command to use to probe for latency. menu: The default menu to show in the GUI. title: The title of the corresponding SmokePing page. remark: The text that will appear on the page. host: The IP address or hostname endpoint. Then, copy and paste the following configuration under the existing default settings. Let's explain what this is doing. Targets are hierarchical, meaning you can nest levels of targets to help with organization. Each nested level of targets will create a new submenu in the SmokePing GUI showing different graphs. In our configuration, the + targets line means we're defining a nested level of targets. Nested targets will inherent the values of their parent configuration, so we don't need to include the probe = FPing line again if we want these targets to use the same probe. However, we updated the title and menu variables for the new subsection, so the page on the site will have a different title and menu. The ++ pkgmir_xxx lines mean we're defining a second nested level which includes two targets. These have a host variable for the address of the endpoint, which are our two FreeBSD pkg mirror servers. The above configuration will create one graph per target. Below it, add one more section to combine multiple targets into one graph. Note that this section uses the two targets we already configured (/targets/pkgmir_nyi and /targets/pkgmir_ydx). Finally, save and close the file. SmokePing's configuration is all set up, so let's connect Apache and SmokePing and start the respective services. Create a configuration file for Apache in /usr/local/etc/apache24/Includes/ called smokeping.conf. This tells Apache where to find SmokePing's files and makes sure it uses FastCGI. The default service configuration for Apache and SmokePing will not start the processes at boot. To change that, execute the following two commands. Now, you can start the Apache service. If not, you'll see an error which you can use to debug any issues in the configuration file. Finally, start the SmokePing service. Note: logging to syslog as local0/info. Everything is running, so let's see our graphs in action. You can see your graphs by navigating the menu on the left. Notice the Targets and Multi Targets options in the menu; these are the targets we defined in the above step. Click on Targets. You'll see the first two graphs we defined, one for each mirror server. On the left, you'll see the nested list of targets, which mirrors our configuration file. Next, click on Multi Targets. You'll see the combined graph here. If you run into trouble, you can check the logs for help in diagnosing the problem. Apache records its logs in two files: /var/log/httpd-access.log and /var/log/httpd-error.log. SmokePing has one log file, which is /var/log/smokeping.log. Remember that if you change SmokePing's configuration, you'll need to reload the daemon with sudo service smokeping reload. In this guide, we set up SmokePing with Apache and created some example probes to test logging and graphing. From here, you can customize your probes and graphs to whatever you'd like to track. SmokePing has a lot of other features, like slaves, alerts, and support for your own mail server. Check out SmokePing's official documentation for more detail.